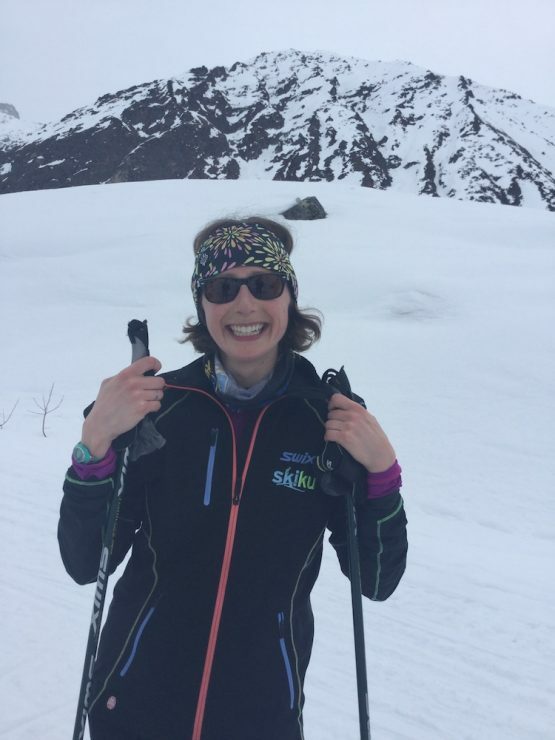 ARCHANGEL ROAD, above Palmer, Alaska — The tenth annual Race to the Outhouse #2, held amidst the Talkeetna Mountains on April 6, marked a neat bookend to the 2018/2019 race season in southcentral Alaska, and possibly in North America. While this season’s Race to the Outhouse #1 was held in early December 2018, roughly one month later than normal, it still marked the season’s first race in southcentral Alaska, and, behind perhaps only Frozen Thunder and a handful of races in Fairbanks, one of the first nordic ski races in the entire continent. Four months later, the SuperTour had come and gone, Senior Nationals had been completed, Junior Nationals had crowned champions just down the road in Anchorage, and it was time to hold the Race to the Outhouse #2. The course goes from a roadside trailhead to an eponymous outhouse some distance uphill, with mountains towering all around. That’s a 750-foot climb over roughly the last three kilometers of the course, or a healthy 250 feet (76 meters) of climb per kilometer. That said, using one figure for the total climb of 927 feet over all seven kilometers suggests that the race course as a whole falls at the far upper limit of FIS-legality for a course certified by the International Ski Federation, as 927 feet of climbing over 7 kilometers is “only” 40.4 meters of climbing per kilometer. The comparison should deepen any armchair ski fan’s appreciation for World Cup skiers’ performance at Holmenkollen (39.1 meters of climbing per kilometer, although of course they have to go downhill there, too) or other hilly venues. That said, the Race to the Outhouse’s maximum climb of 229 meters is well above the FIS limit of 80 meters for a single A Climb, if barely half that of the Tour de Ski final climb (405 meters over 3.5 kilometers). FIS-legal or not, registration occurred via clipboard left atop a snowmachine trailer from 9:30 to 10:28 a.m., with racers collecting the appropriate bib number from a cardboard box after signing their name. At 10:29 a.m. Strabel gave instructions, and at 10:30 a.m. a field of 19 freestyle racers set off. (The morning’s only classic racer had started 30 minutes early. An additional two late-arriving skate entrants started a few minutes later.) At roughly 10:40 a.m., Strabel slowly passed the entire field on his snowmachine, motoring up to the outhouse so that he could record finishing times. First place overall was claimed by this reporter, who had agreed to write an article about the race before he knew he would win, in 23:08. 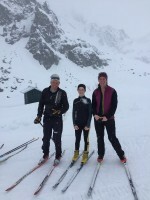 (Of note, the reporter’s quick trip to the outhouse was facilitated by a speedy pair of skis purchased from Holly Brooks.) Local skier and trail groomer Jeff Kase was second, 1:17 back in 24:25. In the day’s closest finish, youth and experience went head to head for the final spot on the men’s podium. Experience (Randy Bladel, an M7 racer) led youth (Noah Hanestad, a U16 racer in ninth grade at local Colony High School) by a few strides coming up the final pitch to the finish, only to see youth pull around him and unleash a credible jumpskate over the final few meters, to which experience was unable to respond. Hanestad ultimately took third in 25:50, with Bladel two seconds back. Following their tight finish, one of them collapsed on the ground just past the finish line, while the other sprinted to the conveniently located nearby outhouse to use the facilities. The first woman in the co-ed mass start was Tamra Kornfield, who finished in 29:03. She was followed by Cindy Decker (31:02), who just held off Dorothy Childers (31:06) for third. Deborah Rix made up the entirety of the classic division. 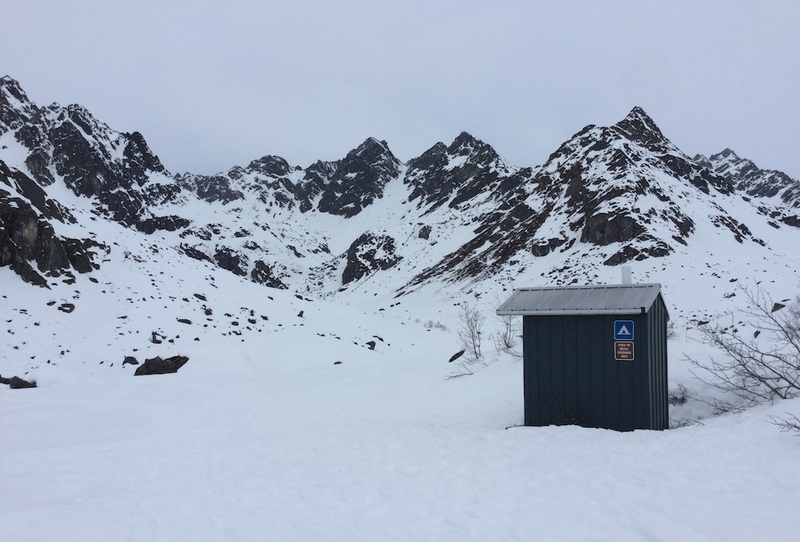 The Mat Su Ski Club’s (MSSC) Outhouse series is a unique event mainly because these ski races are conducted early and late season. As a MSSC member I feel thankful to have access to an alpine elevation trail system and grooming that lets me start my ski season early and extend on ski season well into the spring. Saturday’s Race to the Outhouse 2 was a good reminder that this year is not over and that training for next year starts now. In preparation for the race I woke up early and groomed the trail at Archangel Rd in Hatcher Pass State Park. The freeze thaw cycle requires early morning grooming when the snow is frozen. 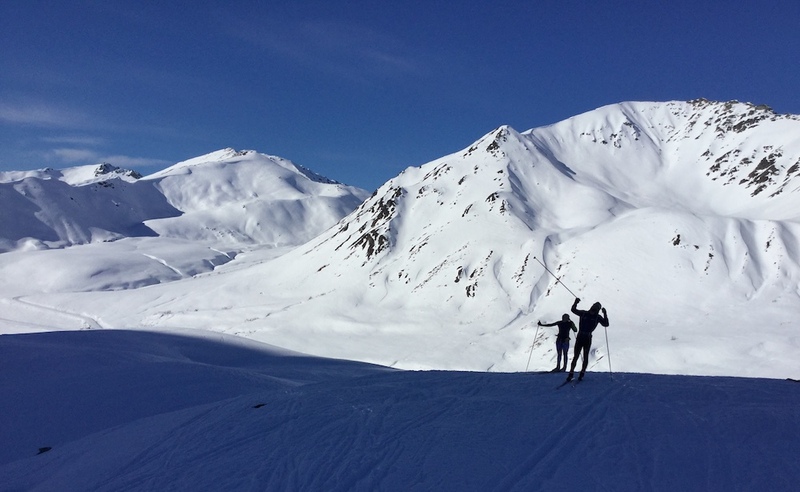 As the day progresses and the sun warms the snow, there is a “sweet spot” for skiing when the conditions on and off trail are firm enough to ski and soft enough to edge. So as I was wrapping up the groom and headed back to the start area I could see a bunch of skiers and racers getting ready and starting their warm up. You never know who is going to show up for the Outhouse Race but as the start time approached several familiar ski racers were present including an APU master skier, Gavin Kentch, who would likely be my biggest competition and eventually won the race. My strategy for today was to hang with Gavin until the bottom of the big climb and then see if I could make him hurt on the long hill. Inevitably I knew a win was unlikely but if I could be on his tails then I could justify all my faux results based on his performances. Turns out I did get second place but not as close as I think I can be. Basically, I realized if I want to stay relevant in the nordic scene, I need to do intervals next year. The most exciting part of the day was watching the uphill sprint finish for 3rd and 4th. I also liked the way that the classic technique racer started 30min early and finished a minute or two after the skaters which means pretty much all the participants were at the finish line at the same time. 16 minutes behind Kase, Anchorage skier Liam Cleary, 10, finished higher than his age when he crossed the finish line in ninth place in the men’s division. Tenth place went to his father, Steve Cleary, three seconds back. Saturday marked his first time ever doing this race, the younger Cleary told FasterSkier after the finish. “It was fun,” he said, “because there’s a lot of uphills, and I like uphills.” He hopes to race again next year. Liam’s results goal coming into the race had been to finish in under one hour. He was thrilled to stop the clock in 40:53, with over 19 minutes to spare. 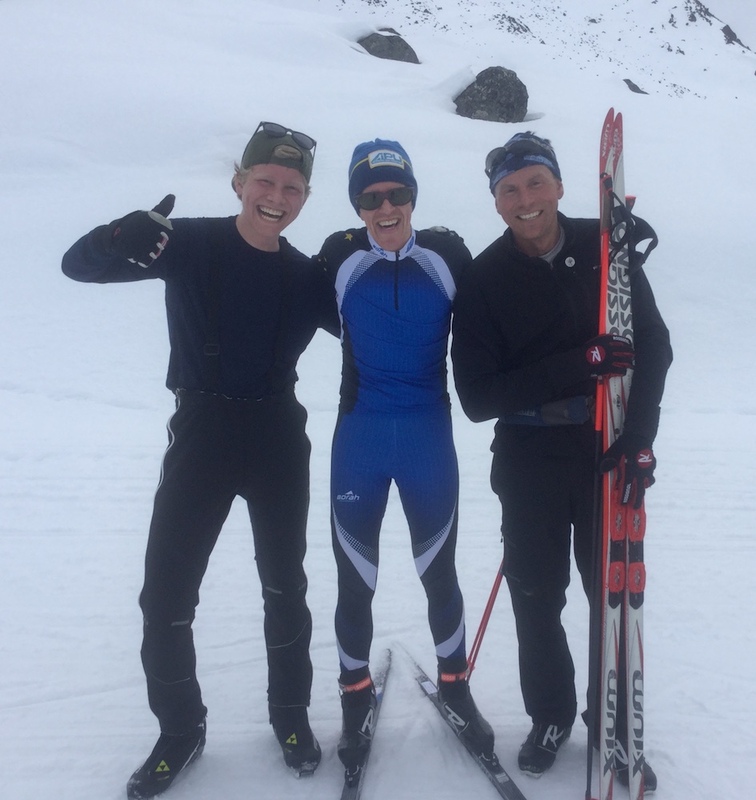 April is a curious time for the nordic ski world. Many skiers are done skiing by this point, out of necessity, for the simple reason that there is no more snow. For those skiers who still have access to snow, additional formal training may seem undesirable following a long race season. And then there’s the siren song of crust skiing. 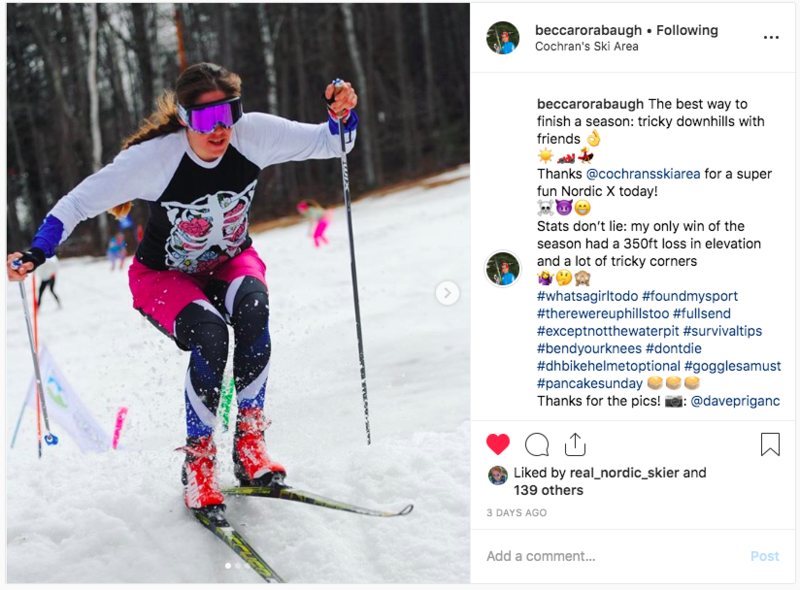 If you follow professional skiers on Instagram in April, you may see them crust skiing, or backcountry skiing, or surfing, or sitting at the beach, or occasionally even sharing candid thoughts about how tired they are… but you probably don’t see many of them doing much serious racing. Put another way, past winners of the Race to the Outhouse #1, held in November or December and thereby providing a valuable early-season race stimulus, include APU skier Scott Patterson, who was 11th in the 50k at the 2018 Winter Olympics, and Alaska Winter Stars skier Gus Schumacher, who anchored the gold-medal relay team at 2019 World Juniors. Past winners of the Race to the Outhouse #2, held in April at a time when race stimulus is the last thing that most people want or need, include, well, this reporter. All the real skiers are sick of racing by this point. So what does that leave for the April racing calendar? Not much, and heavy on the whimsy. There was the Nordic X race at Cochran’s Ski Area in Richmond, Vermont, on Sunday morning. Craftsbury stopped grooming for the year on Monday, but will hold its Mud n’ Ice Quadrathlon, including a ca. 10 k skate leg, on April 20. Alyeska Resort, in Girdwood, Alaska, had scheduled its annual Alaska Skimeister race (alpine skiing, nordic skiing, and fat biking) for the same day, but has already had to cancel this year’s event due to a lack of snow near the base of the ski area, which may have the lowest elevation of any alpine resort in the world at 250 feet. It’s dumping at Mt. Bachelor, and there’s still good skiing in the UP, and the skiing in New Hampshire looks pretty darn good right now… but the will or desire to hold a nordic ski race in April may be limited. Internationally, meanwhile, the FIS calendar for upcoming races in April reads like a survey of exotic northern destinations: Bruksvallarna, Sweden; Ylläs–Levi, Finland; Taivalvaara, Finland; Kirovsk, Russia; Petropavlovsk–Kamchatskiy, Russia; and so on. If you want to race a marathon on the last weekend in April, Norway (either Geilo or Svalbard) is the place to be. And let’s not forget May, as May 4 of this year brings the remarkable sight of an on-snow FIS race held three days after the official training year has begun. The Fossavatnsgangan ski marathon will be held in Ísafjörður, in northwestern Iceland, the latest running of a race first held in 1935. Last race of 2018/2019 or first race of 2019/2020? As the early-May truism goes, next season starts now.